Pioneer Water Tanks offer a range of ladders and platforms for use with their range of water storage tanks. 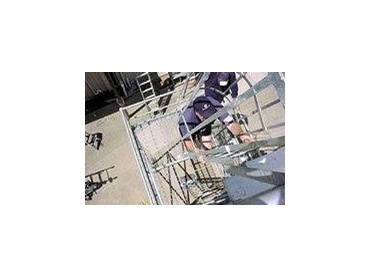 The range of internal and external ladders has been developed to meet Australian Standards (AS1657) and customer requirements. Ladders can be supplied hot dipped galvanised (HDG), coated, or in fibreglass or stainless steel. All commercial style ladders can accommodate external and internal platforms, requirements for cages, and heights of up to 8 metres. The commercial ladders have been designed to connect with either the Pioneer roof platform or the sliding access hatch.